The use of silver for medical and therapeutic benefits dates back thousands of years. 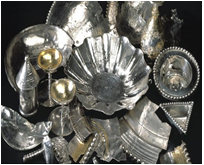 Romans were the first to note and document the “magical healing” powers of silver, and they use it to cover wounds. Cyrus the Great, in the 5th Century B.C., only allows his troops go to war if they were carrying water in silver utensils, something he knew would keep the water clean and safe. Silver's impressive history continues even today because it is recognized as one of the most non toxic and safest of nature's metals. Silver is routinely used in neonatal eye drops to prevent eye infection. It is the preferred antimicrobial in wound care because of its ability to reduce infections without promoting antibiotic resistance. Outside the health care sector, you will find silver in surfaces such as cutting boards and table tops to protect against food contamination, in sports and military clothing to reduce bacteria causing odors, and in water purification filters. Silver is likewise found in homes to help sanitize swimming pools without the harsh effects of chlorine. New technology advances in reducing silver to nanoscale sized particles have enabled the integration of this valuable antimicrobial into a larger number of materials including plastics, coatings, and foams as well as natural and synthetic fibers. Nano sized silver also provides a more durable antimicrobial protection with very high efficacy, often for the life of the product. Due to maximized surface area, very less amount of silver is used for obtaining satisfactory results. Extensive research has been done on silver as long as antimicrobial effect of silver is known. So, silver has been a keen interest for researchers since a long time. With our antimicrobial nano silver solution, it can be potentially applied to almost all the surfaces. Silver technology embedded in plastics, polymers, textile fibers,paints, coatings provides a antimicrobial plastic, antimicrobial/antibacterial polymers & its master batches, antimicrobial fibers, antimicrobial coatings & antimicrobial paints.